Thatcham Town Football Club was founded in 1894. 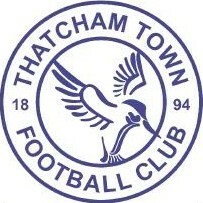 The club were originally known as Thatcham, with Town being added to its name in 1974. In the early years Thatcham played at The Marsh on Dunston Green, Brownsfield (home of the Cricket Club) and Station Road, before moving to Lancaster Close in 1949. Floodlights were erected in January 1983 with Fulham FC visiting for a friendly to commemorate their switching on. To provide improved facilities the club moved to Waterside Park in 1992/93. The club joined the Reading Temperance League in 1896, winning the Division Two title in 1905/06. In 1953 Thatcham became founder members of the Hellenic League and won promotion to the Premier Division as Division One champions in 1958/59, 1964/65 and 1972/73. The club then won the Hellenic Premier Division title in 1974/75. Following spells in the Athenian and London Spartan Leagues, the club joined the newly formed Wessex League in 1986 and won the title in 1995/96. After finishing second in 2005/06, ground requirements were met and promotion to step four achieved. The Kingfishers spent eight seasons in the Southern League Division One – seven in the South & West Division and one (2012/13) in the Central. After sixth-placed finishes in 2006/07 and 2008/09, the club achieved its highest ever position in 2010/11. Despite being in the bottom half of the table at Christmas, the club earned 38 points from the final 15 matches to finish in fifth, however Thatcham were beaten at Sholing in the play-off semi-final. Once safety was assured in 2013/14, the club resigned from the Southern League to cut costs by playing at a lower level. Town finished twelfth in their first campaign back in the Hellenic Premier, and finished second and fourth the next two seasons. However in 2017/18 the club embarked on an incredible 40 game unbeaten run which saw them overtake long-time leaders Highworth Town and eventually pip Bracknell Town to the title on goal difference. In 1989 Thatcham reached the last eight of the FA Vase before losing to local rivals Hungerford Town. In the same competition a record attendance of 1,400 was set when Aldershot Town won 1-0 at Waterside Park in 1993/94. However in 2017/18 Thatcham went all the way and lifted the trophy at Wembley Stadium on a brilliant day for the club. Victory over Bromsgrove Sporting brought realisation the club could be on the verge of something special, then over 2,200 attended the quarter-final win at Melksham Town as cup fever swept the town. Thatcham beat 1874 Northwich 1-0 and 3-2 in the two-legged semi-final, and took over 5,000 fans to Wembley as Stockton Town were defeated 1-0 in the final. 1996/97 saw Thatcham’s best FA Cup run as they reached the Fourth Qualifying Round, but the club are yet to progress beyond the Second Qualifying Round of the FA Trophy. Thatcham completed the Hellenic league and cup double, by lifting the Hellenic First Division Cup in 1972/73 and the Premier Division Cup in 1974/75. Also in 2017/18 the club reached both league cup finals, only to lose to Bracknell in the Challenge Cup and Binfield in the Floodlit Cup. Meanwhile during the 1990s Thatcham won the Wessex League Cup on four occasions, completing the double in 1995/96. In 1974/75 the club lost the final of the Berks & Bucks Senior Cup but were awarded the trophy following a dispute between Wycombe Wanderers and the Berks & Bucks FA. Following on from the club’s best ever season, the club are hungry for more success and enter 2018/19 back in the Southern League, ready to renew some old rivalries in Division 1 South.